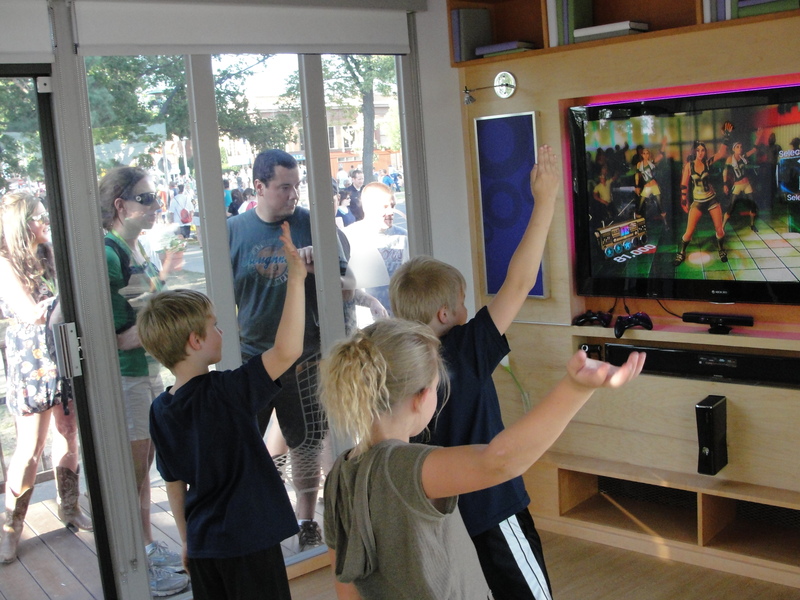 Dancin’ up a Storm – Kinect Rocks! About 6 months ago, Jason Strate sent me a video showing the newest thing in Video Game Technology – Project Natal. I thought it was kind of a cool idea, but wasn’t really excited about it. Part of the reason, was because it was on the XBox platform. I love my Wii. I grew up with Nintendo. Wii was the first game system my kids ever had. We have family bowling tournaments, or all play Band Hero together. When we play many of the games, it feels like we’re getting somewhat of a workout. Getting exercise while we play is a bonus in the winter months (especially weeks like this last one, where wind chills never got above zero!). Fast forward to the MN State Fair last summer. Project Natal had since been renamed Kinect. They had a couple of booths to allow people to play. Jason and I, and our 5 kids, all piled into the booth to play. It was kind of cool, but I still wasn’t convinced I HAD to have one. Still didn’t have an XBox 360, wasn’t really interested in getting one… Jason and the kids, however, couldn’t wait! After spending more and more time with Jason and his kids, my kids (especially Michael, my 5 year old) REALLY wanted an Xbox 360. Santa brought one to our house. It has quickly replaced the Wii as my kids’ favorite game system. We have over 15 games for the Wii, and only 3 for the Xbox, but that doesn’t matter to them! We still play our Band/Guitar Hero, DJ Hero, and bowling on the Wii, but the Xbox 360 is quickly taking over. Santa brought a Kinect to Jason’s house. After trying a few games on it, I am finally convinced. I am admittedly, a bit out of shape. I find myself a bit winded after almost every game on it! It’s a heck of a lot of fun playing the tubing game on Kinect Adventures; boxing, volleyball, and bowling are a lot of fun on the Sports game too. My favorite, though, has to be Dance Central!! I had read some reviews on it that made it seem like it might be too hard. Being a dancer most of my life, and a “Club Chick” in a past life, I LOVE this game!! It is a little bit like DDR (that’s Dance Dance Revolution for those of you who don’t know) in that it tells you which moves are coming up. I always found DDR a bit challenging. In my experience, the mat moves too much, adding to the frustration level. In Dance Central, YOU are the controller. No mat to bunch up. You use your entire body instead of just your feet. It almost feels like you are at the club, joining in a flash mob dance. It is VERY fun! The music is great too. Mostly current music, with moves that are not outdated either! For anyone who likes to dance, I would recommend getting this game!!! This past weekend, we had all the kids playing Dance Central… some of the more advanced dances (even on easy) were a bit tough for them. Admittedly, if I wasn’t in hip hop classes, they would have been more challenging for me too. I’m not saying they weren’t – “Satisfaction” will definitely take some time to master, as I’m not good at locking moves… Still loving the game, and looking forward to moving on to the medium level! Trackback: Wii vs XBox 360 « Moments of Brilliance… or Not! Trackback: Wii vs XBox 360 | Moments of Brilliance... or Not!